So I officially started packing some things up a few days ago, and we gave our move-out notice to the leasing office yesterday. Hello, stomach butterflies. But I’m excited! For as much as I’ve been getting rid of in the past year, we’re still not out of the woods when it comes to dropping everything and moving across the country. The bulk of our strategy revolves around our furniture, but there’s definitely still some random trinkets that have accumulated in this apartment that I’m not sure how to deal with. Hence, The Moving Strategy. My husband and I sat down this week and decided how we were going to approach everything. It’s a lot like what I’ve been doing, only this time there’s a few more things to keep in mind once we decide whether to keep things or leave them behind. I imagine that if our stuff was cognizant and could grasp what was going on, this might terrify and thrill them – one of six things could happen to them. Would it be the great honor of coming with us in our car? Or would it meet the terrible fate of heading out the door as trash? You’ll notice something that hasn’t come up before (and in fact, seems a bit contradictory to the whole “minimal” thing), and that’s storing things. It sounds bad, but we’re most certainly not going the route of self-storage units, and absolutely only storing a few key things that we’ll use to furnish our home if we someday return to the midwest. Let me digress for a moment on the topic of self-storage. Did you know there’s enough covered storage space in the US for every man, woman and child in the country to stand? So, while we have issues with homelessness and poverty, some people have so much that they need extra space to keep it. There are legitimate reasons for self-storage, but can those legitimate reasons make sense of the 2.3 billion square feet of storage that’s now available to our country? (I’m finding this info here if your curious to see more numbers). My apologies. Let’s dig in to each option (and I’ll explain the storage one). First, my husband and I will decide whether to keep something or leave it, then we’ll have one of three options. 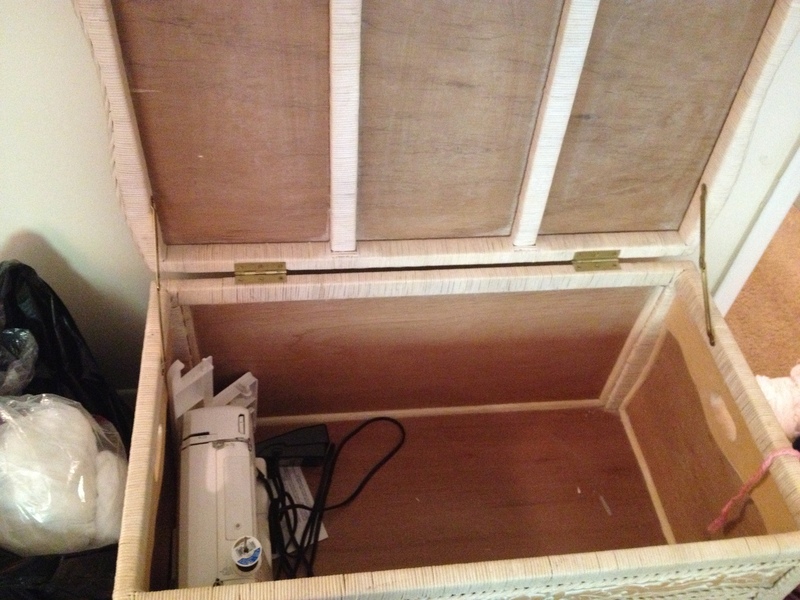 If it fits and is super necessary to our travels, it gets to come with us in our car. This could get dicey, since we drive a small Honda Civic and are also bringing our sweet rabbit. He takes up a nice chunk of space, but is a non-negotiable when it comes to what stays. If there is such a thing as a master shipper, my dad is that thing. He is a wizard when it comes to packaging and shipping things to all corners of the country, and I’m incredibly lucky to have him on my team for this one – my husband and I will pack everything that we want to ship into boxes with labels, then my dad will ship them as we need them. Since we don’t want to deal with too many shipping costs, again this will be minimal. Hopefully we can do it in 6 boxes or under. Again, we’re fortunate to have some wonderful family support. My husband still has to figure out which of his four guitars will come with us (some will sell), but a couple of them are sentimental/family heirlooms so those will most certainly stay with us. But will they fit in the car? Maybe not. And we’re not shipping them, so storing with family it is! My parents also gifted us a lovely (and expensive) bedroom set that will be ours once again when we move back into the area to settle down. Since they have an unfurnished spare bedroom, everything, including our mattress, will stay with them. Here’s a big one that I can’t wait to do: we’re selling the TV. And the PS3 (don’t worry, hubs will be getting a PS4 sometime mid-2015 so he can play Batman). And the record player, the kitchen table, Rorschach’s giant dog cage (the rabbit lives in a cage meant for a German Shepherd). Bookshelves, random tables, you get the picture. If selling doesn’t work, we’ll donate! I’m thinking of donating a couple of handmade blankets to a women’s care center. Books will be donated (not exactly sure where yet) and fragile glassware will be handed over to family who’d enjoy it more than we would. We’ll try to donate to good causes, but in the end if there’s a time crunch, we may rely on good ol’ Goodwill to take things off our hands. 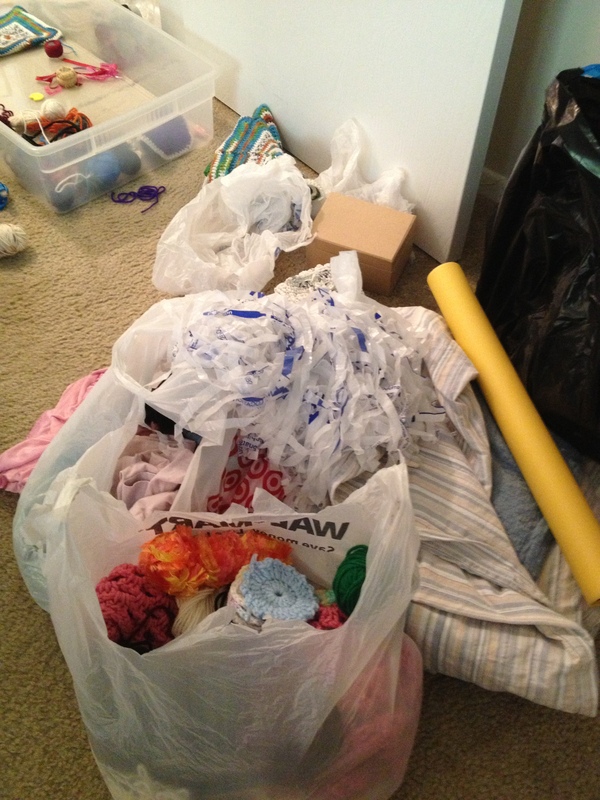 This last category is mostly for random papers, unusable bits of craft supplies, random trinkets that don’t even make sense…recycling first, yes, but that dumpster is sure to see a lot of our old randomness soon. Since I’ve gotten a lot of awesome comments from people sharing their personal anecdotes, I feel like I can let you in on how we’re both feeling about this move. We’re friends, right? Well it’s nothing too dramatic – we’re just excited to get things rolling! My husband officially has a job lined up, and has a less-official but much cooler job opportunity in the works too. I’m getting more into the swing of working from home and am planning on how I can be social once we get out to Los Angeles. All good, positive, happy things before the storm of actually moving and sorting through things hits. Any Los Angeles-based readers want to meet up for coffee sometime? I’ll be there in January! A couple of weekends ago I was going about my usual business, tossing clean towels haphazardly into the terrible cavern that is my bathroom cabinet. They didn’t even fit into the drawer I was trying to put them into, since there were so many old rags and random bathroom products in the way. So, I ripped every bit of “stuff” out of that cabinet. I made a trash stack, a keep stack, and a donate stack (it was quite small, being from the bathroom and all). My fiance came home to find our hallway littered with, well, litter, and me curled up in a corner of our tiny bathroom untangling decades-old necklaces. I was in my element. The before and after may not be super impressive in the photos below, but I was able to get rid of a lot of old, expired, or otherwise non-essential items. After – Niels even had room to play! I’m surprised at how much space I have now. Expired or just old. Seriously, I had some facial lotion that was half a year expired. I had body spray that was a decade old. Some lotions were almost used up, but I hadn’t gotten around to using them…for 5+ years. Tossed. Not my style. You know those scents and strange products you sometimes get from people you sort of know, or from random events like showers and stuff? If it was unopened, I donated it, but if it was opened, I referred to the previous point. Most of them were very old anyway. If not, I shared it with my mom or a friend who might find it more useful. Never been used. Sometimes, I’ll get on kicks of purchasing new, fun products. Then a few months (or years – again, I tend to hold onto things) later I realize that I don’t want to put whatever it is on my skin. If it freaks me out, I toss it into the appropriate pile and make a note to never purchase it again. With all of this came the intention of paring down and only using a few products for everything. Washing, cleaning, brushing, you name it – I want to do it all on my own terms with my own favorite items. Castile soap. If you’re into minimalism, but not yet into castile soap you should rethink everything. Maybe not, but seriously this stuff has so many uses and I absolutely love it. Baking soda and vinegar. Again, love these two things for almost everything. I use them to wash my hair, but I also use them to disinfect my bathroom (with castile soap, too). I use them to unclog drains, vinegar to keep dishes sparkling and clear, and sometimes baking soda to brush my teeth (I’m not the best at keeping up with homemade toothpaste). More soap, less everything else. For Christmas, I asked for soaps. I ended up getting something like 5 different bars of soap. I suppose you could say I really cleaned up this year? It’s a consumable gift that I enjoy quite often and now I have room for my soap collection in my cabinet. I think I need to take more showers so I can start using it up a little more quickly. 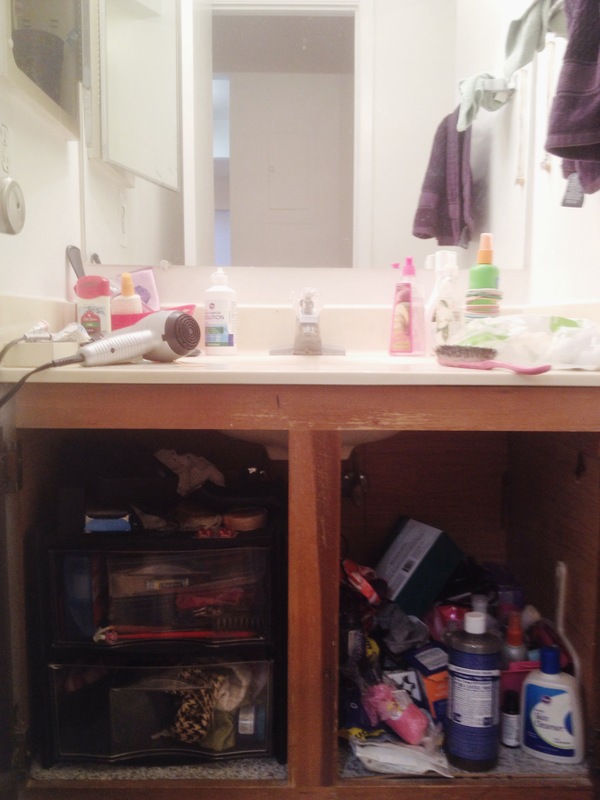 My bathroom cabinet is still not quite where I’d like to see it, but it’s definitely an improvement. I don’t get stressed everytime I open it up…it’s funny, we don’t think about what small spaces of clutter like this can do to our minds. It’s something I never outwardly stressed about, but if I was already having a bad day it could often make it worse. 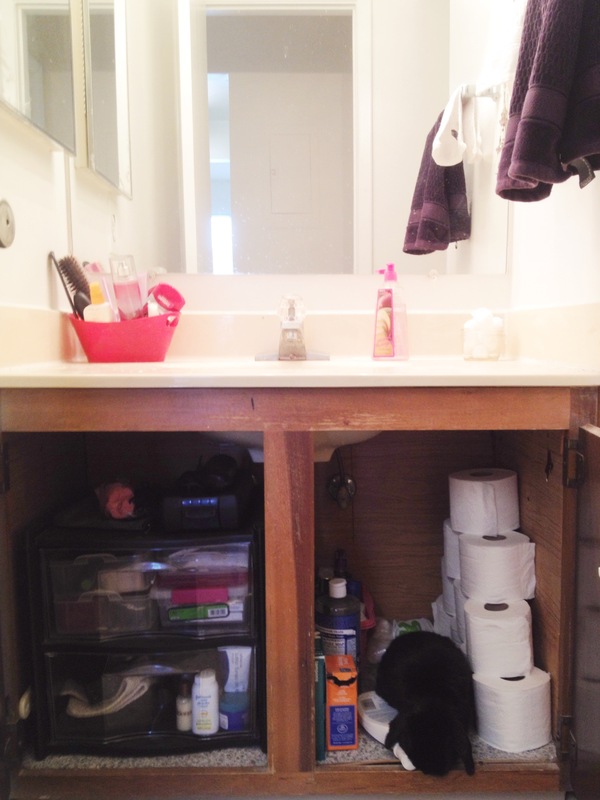 I dare you to go to your bathroom and open up all the cabinets. What percentage of the stuff do you actually use on a regular basis? Mine was somewhere at about 20%. Now it’s closer to 75-80% (like I said, still getting there!) Take an afternoon and trash/donate/rehome the stuff and let me know how it feels. Look how happy/insane I am! I must have just had a ton of coffee. I still feel rather overloaded with clutter, but I’m seeing improvements. 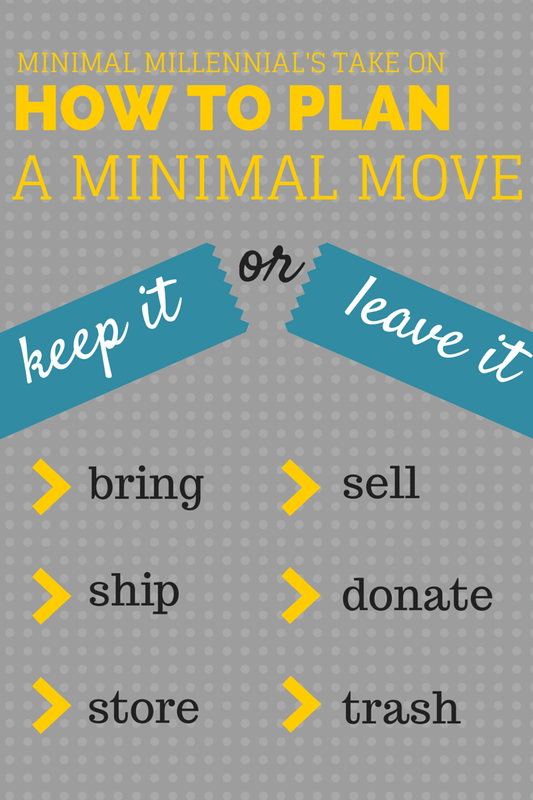 In fact, I’ve noticed an immense upswing in my enthusiasm for minimalism. I’ve realized there is not an end to this–the goal of this lifestyle change is to enjoy the process and the “small wins” that add up along the way. 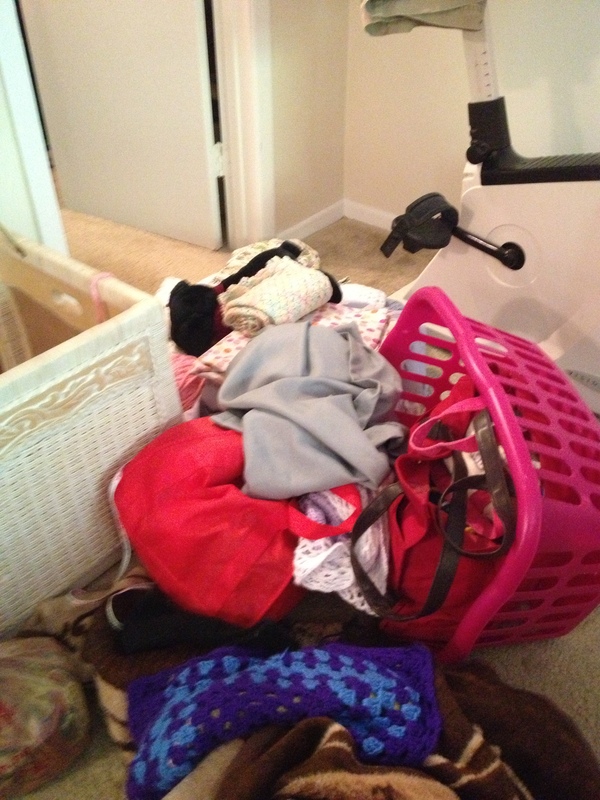 Through the process of eliminating clutter a little bit at a time, I focus on what is essential to my life. Do I need this weird jacket? Do I need these shoes that are cute but hardly fit? (I bet you probably have a pair just like that). I’ve found that I don’t miss the several hundred items I’ve eliminated in the past year. In fact, I feel more satisfied with my lifestyle than I did one year ago. Awareness is everything—are you truly grateful for every little thing you have? Or is there too much to even inventory? Don’t drown in possessions. Keep just what you need to stay afloat, and you’ll feel lighter and lighter every day. How did you do with this challenge? I recently spoke with a friend about my frequent “100 Less” weekends. I’ve come to the point where I’m struggling to decide what to get rid of, and eventually I’d like to be at the point where if I eliminated 1 more item from my home, my quality of life would diminish. That’s my goal–nothing unnecessary, nothing distracting. Only the essentials. 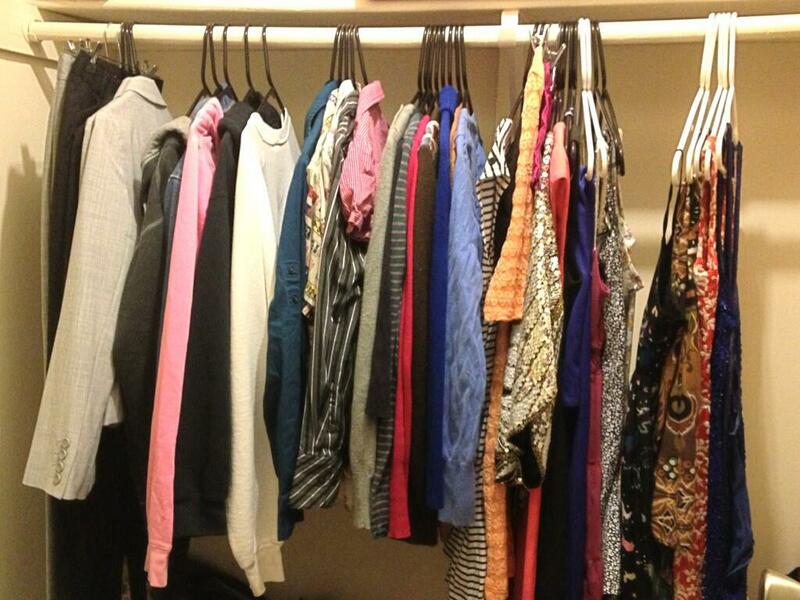 I am so proud of my 42-item closet nowadays. My friend suggested that I offer this challenge up to others as well. 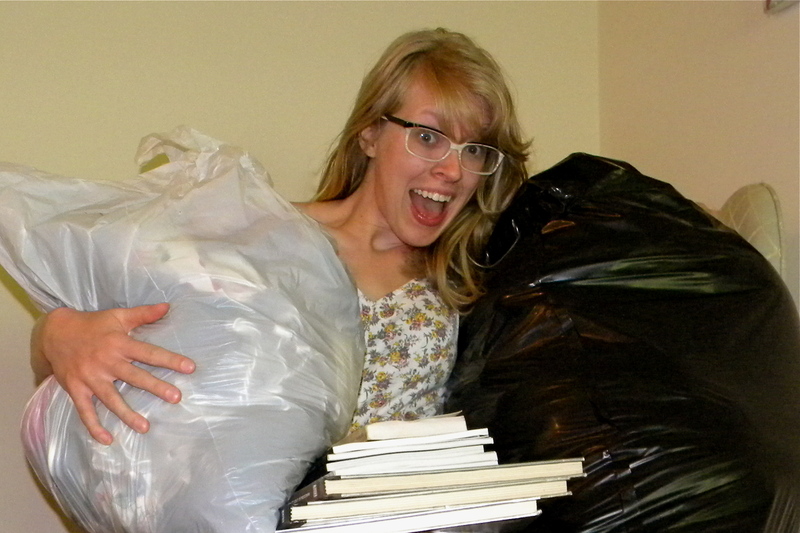 With Memorial Day coming up, I challenge you to get rid of (trash or donate) 100 items. It’s a lot easier than you think–you may notice that getting rid of 100 things will not even make a dent in your amount of possessions. Some more extreme (yet totally cool) people actually live on 100 things or less. I know that many people my age complain about being broke. However, this challenge should give you a chance to reflect on how wealthy you truly are. Look at every material possession you’ve been blessed with, earned for yourself, or been given by people who love you. Appreciate it, then send it off to someone new if you no longer use it. And don’t buy any more. You’ll uncover “stuff” from childhood and from high school that has no function other than taking up space in your life. Snap a picture of it if you’re sentimental, then send it off to Goodwill. I’m still chipping away at the unnecessary things in my life in order to declutter and regain some control over my possessions. It’s easy enough. While you’re struggling to organize your home or apartment or dorm room this weekend, set out 2 bags. One for trash, and one for donation. Once you’ve eliminated 100 items, take a look around. Can you swing another 50? Another 100? I find that taking it 100 at a time is less overwhelming, but I do often continue if I’m on a roll. Take the 100 Less Challenge and report to me how it went in the comments below. I’ll follow up next week. Happy decluttering!